A multi-model analysis of Atlantic multidecadal variability is performed with the following aims: to investigate the similarities to observations; to assess the strength and relative importance of the different elements of the mechanism proposed by Delworth et al. 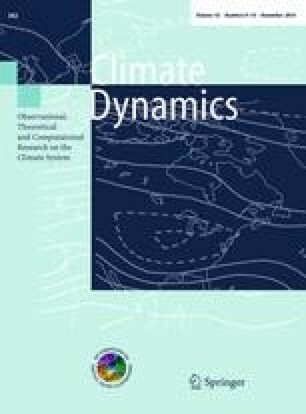 (J Clim 6:1993–2011, 1993) (hereafter D93) among coupled general circulation models (CGCMs); and to relate model differences to mean systematic error. The analysis is performed with long control simulations from ten CGCMs, with lengths ranging between 500 and 3600 years. In most models the variations of sea surface temperature (SST) averaged over North Atlantic show considerable power on multidecadal time scales, but with different periodicity. The SST variations are largest in the mid-latitude region, consistent with the short instrumental record. Despite large differences in model configurations, we find quite some consistency among the models in terms of processes. In eight of the ten models the mid-latitude SST variations are significantly correlated with fluctuations in the Atlantic meridional overturning circulation (AMOC), suggesting a link to northward heat transport changes. Consistent with this link, the three models with the weakest AMOC have the largest cold SST bias in the North Atlantic. There is no linear relationship on decadal timescales between AMOC and North Atlantic Oscillation in the models. Analysis of the key elements of the D93 mechanisms revealed the following: Most models present strong evidence that high-latitude winter mixing precede AMOC changes. However, the regions of wintertime convection differ among models. In most models salinity-induced density anomalies in the convective region tend to lead AMOC, while temperature-induced density anomalies lead AMOC only in one model. However, analysis shows that salinity may play an overly important role in most models, because of cold temperature biases in their relevant convective regions. In most models subpolar gyre variations tend to lead AMOC changes, and this relation is strong in more than half of the models. We thank the Deutsche Forschungsgemeinshaft under the Emmy Noether programme (Grant KE 1471/2-1) supported JB and NK. Support from the European Community’s 7th framework programme (FP7/2007–2013) under grant agreement No. GA212643 (THOR: Thermohaline circulation—at risk? 2008–2012), No. 266722 (SUMO) and PCIG10-GA-2011-304243 (STEPS); RACE project funded by German Federal Ministry for Education and Research; and the Centre for Climate Dynamics are acknowledged. Computing resources from GEOMAR and Rechenzentrum der Universität Kiel are greatly appreciated.